It had to happen, right? Instagram has finally crossed the last threshold with their Snapchat-cloning Stories feature, the final element which they'd not yet duplicated. This week, via the Instagram blog, the platform has announced the arrival of what they're calling 'Face Filters'. The addition makes perfect sense - as Instagram continues to grow its Stories option, and push to challenge Snapchat, they need to provide all of Snapchat's Stories tools. If you can get all the same features on Insta, where more of your friends are present, why go to Snapchat at all? And Lenses are a significant part of the Snapchat experience. As part of their IPO documentation, Snap Inc. noted that a third of their 166 million daily active users "play with Lenses everyday". Lenses also serve as something of a gateway to Snapchat, the thing that people show to others to get them interested. Now Instagram has the same - along with variations of every other creative tool in Snapchat's repertoire - it's more likely that Instagram's larger user base will keep more users away from Snap. This is particularly relevant for international expansion - Instagram's already available in more regions than Snapchat, and they're actively working on tools and options to expand their global reach. With Instagram now providing these types of creative tools in many regions first, Snapchat's growth prospects are also reduced, as Instagram, despite being the copycat, will actually get first-mover advantage. A noted by TechCrunch, Instagram's gone with a less confronting, more ornamental version of Lenses, a more subtle accompaniment to digitally enhance your Stories posts. That could help make the function more universal, get more of Instagram's user base - from young to old - trying them out, they're more decorative than transformative, though Instagram could easily add many more variations in future. At launch, there are eight Face Filters to chose from. 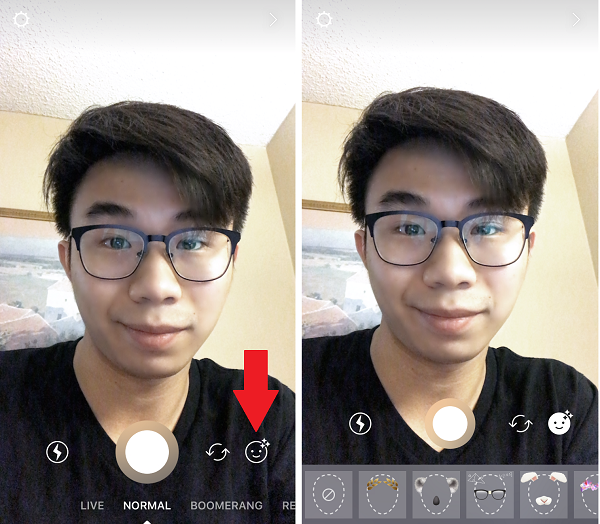 To apply them, you can press on your face on screen within the Stories composer (the same as you do in Snapchat), or you can tap on a new smiley face icon to bring up the set of filter options. The direct connection button makes the option easier to find for non-Snapchat users. There's also no word on whether Instagram will add sponsored Face Filters, but again, there's a whole set of possibilities. 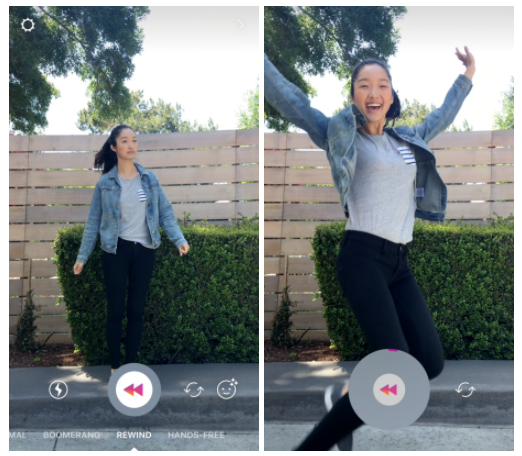 Along with the addition of Face Filters, Instagram's also adding a new 'Rewind' option to enable users to make Stories videos that play in reverse. As you can see from the above image, the Rewind tool is available between the Hands-Free and Boomeraing tools, giving users another way to customize their Stories content. Instagram's also, unsurprisingly, adding a new eraser tool, similar to Snapchat's just launched 'Magic Eraser' option. Okay, it's not exactly like it - Snapchat's tool uses a Photoshop-like blur functionality to virtually remove objects from the frame. 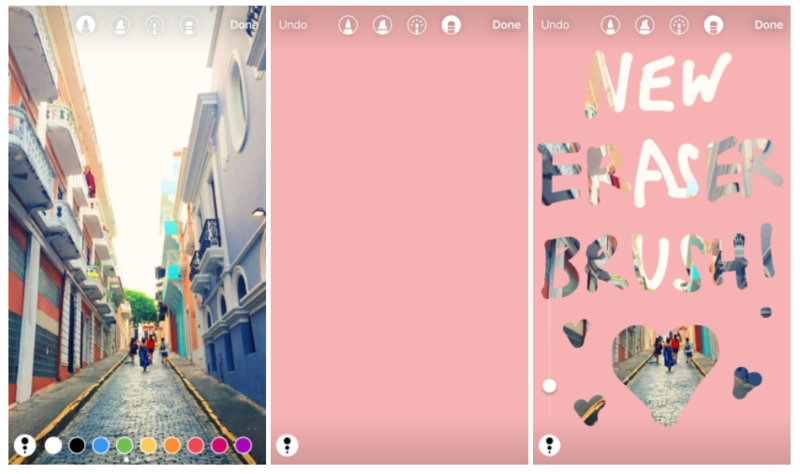 Instagram's eraser brush adds new creative options by enabling you to delete elements you've added, revealing the original photo underneath, which can provide some cool creative options like the above. Instagram's also adding new customizable hashtag stickers, enabling you to add any tag you want and append it to your image. Once you've added a hashtag sticker, anyone watching your Story will be able to tap on it to explore other public posts using that tag. The functionality is similar to @mentions within Stories content, which Instagram added last November. Verified users can even add links to their Stories, but that option hasn't been made widely available at this stage. And while it may seem minor, particularly in comparison to Face Filters, the addition of hashtag stickers could actually serve a wider purpose, with TechCrunch reporting that Instagram's also testing a new Location Stories feature which compiles publicly shared Instagram Stories posts which have been shared with a location sticker. 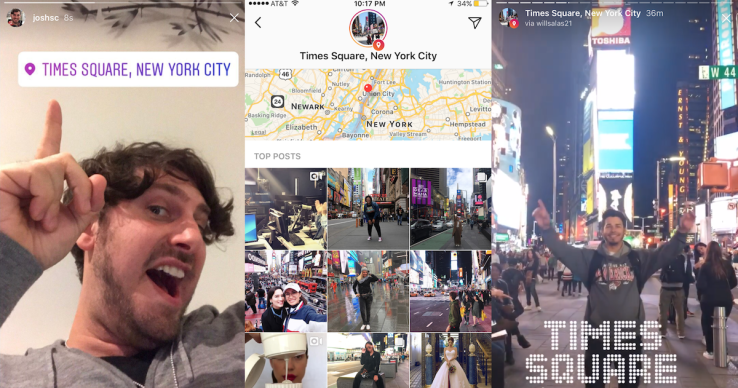 Somewhat similar to Snapchat's 'Our Story' feature (and their more recent search upgrade), Location Stories would enable more people to discover relevant Instagram Stories, which would initially be linked to specific landmarks and places. 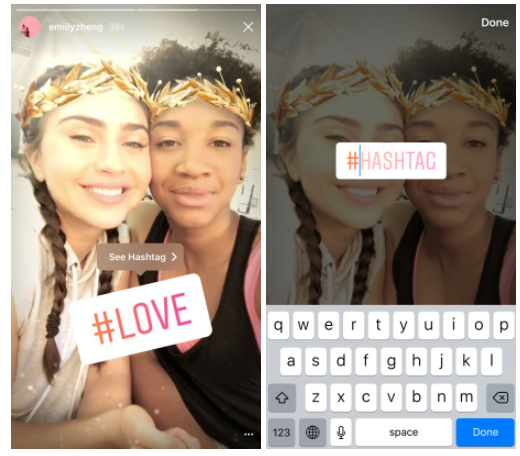 But the addition of hashtag stickers could also open the door to boosting Stories discovery based on these tags also, making it easy for users to look through stories content posted in relation to a theme. There's a lot of stuff to take in, a lot of new options - basically, Instagram has now duplicated all of Snapchat's Stories options to some degree. And given Instagram has been growing faster than ever since the introduction of Instagram Stories, it's probably safe to assume the new additions will prove popular, and will make Stories a more relevant consideration, for both individual users and businesses, moving forward. But what's also interesting here is that it's no longer surprising - Instagram directly and exactly copying Snapchat is now the expectation. When Instagram first announced Stories, there was a level of shock that they could so blatantly duplicate a core function of another social app. But now that threshold has passed, its expected that Instagram's going to duplicate Snapchat's tools - which likely doesn't bode well for Snapchat's development moving forward. "From the very first photo filter to Boomerang and more, Instagram has always been the place you can go to turn regular moments into something you can't wait to share." That's right - we may be copying Snapchat, but we were the originators of turning regular moments into something you want to share. Seems like an unnecessary dig, especially when Instagram Stories already has a lot more users than Snapchat, and a lot more opportunity to expand into new markets. So, a new set of tools to try out, a new range of opportunities to consider. If you've not considered the potential of Instagram Stories for your business, it may be worth considering - particularly as usage will no doubt expand as a result of their latest tools.